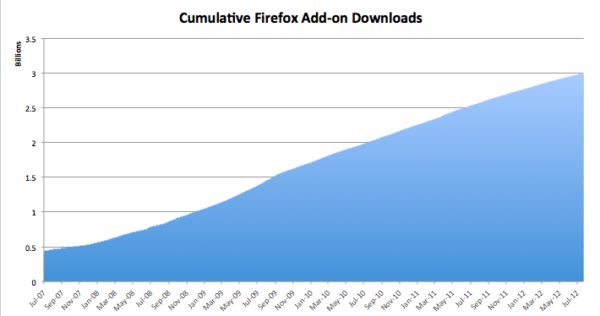 Firefox Add-ons Cross More Than 3 Billion Downloads! We are excited to announce that we just crossed more than 3 billion downloads* of Firefox Add-ons! That’s almost half of the world’s population and more than the number of people on the Internet today. Mozilla introduced add-ons to the Web in 2004 with the Firefox Add-ons Gallery and first brought them to phones in 2009 as a way for you to customize the features, functionality and look of your Web experience to make Firefox truly your own. Firefox Add-ons enable you to customize the features, functionality and look of your Web experience. With add-ons, you can personalize Firefox to fit your needs and interests in music, games, entertainment, sports, appearance, language support and more. More than 85 percent of Firefox users have at least one add-on installed and of those people with add-ons installed, they have an average of five add-ons. The most popular add-ons include AdBlock Plus, Firebug, NoScript, Personas Plus and Video DownloadHelper. Most popular categories include privacy and security, search tools, bookmarks and themes. There are more than 150,000 user-created collections of Firefox Add-ons to choose from, including Family Organizer, Traveler’s Pack, Sports Fanatic, The Paranoid Kit, Web Developer’s Toolbox and Online Shopping. This amazing milestone was made possible by the hundreds of millions of Firefox users and more than 25,000 Firefox Add-ons developers around the globe. To thank you, we wanted to share the below infographic for a snapshot of Firefox Add-ons statistics and milestones. Thank you! We hope you continue to enjoy using Firefox! * This number includes only downloads from the Firefox Add-ons Gallery and does not include themes. Grande FirefoX sigan innovando !